The Klamath River salmon and steelhead season is just around the corner and if you haven't secured your 2016 trip you might want to act fast. This season is filling up and we are booking trips earlier than ever before. The Klamath River Fishing in the fall is one of the most productive and exciting fisheries you will find in the lower 48. The river is stuffed full of king salmon that we can target for a solid month. Once the salmon start spawning the famous run of half pounder steelhead move up and take the stage. If you haven't experienced the salmon spawn on the klamath river and the steelhead that go along with it your are missing out. It's one of the most amazing things I have ever seen. 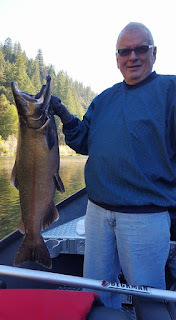 I have not found a river on the west coast that even comes close to the action me and my clients enjoy every year. Here are the remaining dates for the 2016 Klamath River Salmon and Steelhead season.